your capacity to speak and be heard! that brings the celebrated four-day Transformational Speaking Immersion directly to you! When you take the time to catch up with yourself and give voice to who you are and what you love, you change, your life changes, and you bring healing to our world. Yet most of us are in jet lag and haven’t caught up with who we’ve become in this amazing journey called life. We’re either in a growth spurt where we haven’t yet found the words to communicate our experience, or we’re unduly attached to what has worked for us in the past. When we look outside ourselves for a strategy, instead of inside where our truth and originality reside, we don’t even know our best stories and material. The original, amazing part of your own story often needs to be reawakened and explored. At Transformational Speaking—Online! we dive deep. We find buried treasure. In the process, we reach for creation of your new expression rather than dictation from an old mindset. When you find and trust your true voice, you’ll find your way to speak and be heard. You’ll grow bolder as you bring your gifts fully to the world and make the contribution that only you can make. Then you will step into the message you were born to share with the audience you are destined to serve! to yourself so you embody your message and connect authentically with others—with ease! force of argument with those who can’t—and in the process, find your tribe! as touchstones to what to say yes to and what to say no to. Just imagine . . . what it will be like when you stop believing that some new strategy will finally be your ticket to a sustainable business, and instead start believing in yourself! Each of the seven modules is filled with step-by-step training audios, worksheets, and video conversations with Transformational Speakers to support you in applying what you’re learning. You’ll have 24/7 access to the Real Speaking® Academy to listen to the audios and view videos of Transformational Speakers in conversation and in action. Our live group calls provide a forum to get answers to your questions, strategies for any challenges that have come up, and coaching as you explore what’s emerging for you. 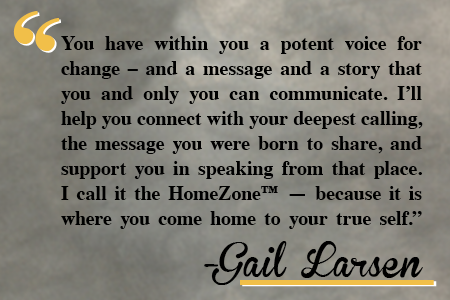 There’s also a private Facebook community to leave comments, post short videos for feedback from Gail and the group, find a partner or create a small Circle of Friends, ask questions, and compare notes with others on the Transformational Speaking journey. You get all the teachings and processes of the live Immersion in this elegant online course, and you can start right away! Tell me a fact and I’ll listen. Tell me a truth and I’ll learn.